August is always met with mixed emotions. For parents, August means the beginning of school and time to—even though you dearly love them—get the kids out of the house! August is also usually that last hurrah of summer activities before fall’s cooler weather begins to set in. Fall also brings the beginning of holiday festivities and the colorful and sometimes extremely extravagant decorating that comes with it. In our last several blogs, we began discussing the basics about electrical panels. 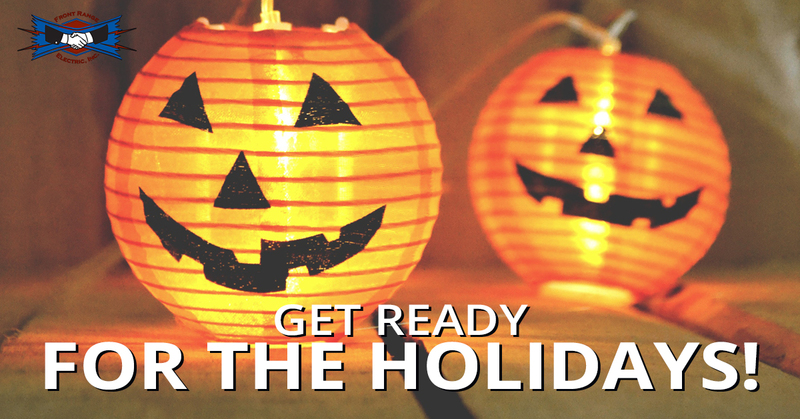 Today, we will be talking about everything you need to do to prepare your electrical system for the lights and other decorations that you will be plugging into your outlets for Halloween and other fall festivities. Whether you are getting ready to pull out that scary decoration that makes all the neighborhood kids scream in fright or you are preparing to reinstall your favorite fall wreath with twinkle lights, it’s always best to examine the electrical elements of each decoration that you are preparing to set out before plugging them in. Check each cord to make sure that it is fully intact; check for fraying, tears, and other damage. If the cord appears damaged, discontinue use and either repair it or replace it entirely. It could be time to retire that twenty-year old decoration and invest in something new to delight or excite terror. As you check your indoor and outdoor decorations, you should also inspect the extension cords that you will be using within and without your home. Check your electrical cords for fraying, tears, or exposed parts. If only part of the electrical cord works, it may be time to throw it out and invest in a new one: Extension cords are incredibly less expensive compared to electrical damage or a house fire. You should also test the outlets that you will be using. Most outlets and particularly those that are outdoors will have a GFI circuit. GFI stands for Ground Fault Circuit Interrupters. The purpose of GFIs is to protect your home’s electrical grid from overload and other dangerous electrical phenomena. Each of your outlets with a GFI will have two buttons that read “TEST” and “RESET.” Before you plug in in your decorations or extensions cords, check each outlet, by pressing the TEST button. To test, plug in an item and press the test button. If you hear a “snap’” noise and the power is cut to that outlet, you can rest assured that your GFI is working. This is the conclusion to part one of our blog series about home holiday safety! Though we know it’s only August, it can be a good idea to start preparing for the holidays—why? In some cases, for homeowners who have older homes or those that are wishing to really put on a show with their decorations, it is important to consider if your current electrical system can handle the load necessary for your holiday decorations. If you’re concerned that your system might not be able to handle your holiday decor plans or simply are wondering about the health of your electrical system, contact a local electrician in the Colorado Springs area now, so you can be completely ready for the holiday season. Are you in need of a local electrician? Contact Front Range Electric! Our electricians serve the Colorado Springs area and can help you with all your electrical needs. When preparing for the holidays, some of our clients need a slight repair to their electrical system and in other cases, they need a complete remodel and an electrical panel upgrade. Visit our website to learn more about us and the services we provide!